A successful company logo accomplishes so much. It speaks for the quality of the brand and the reputation it creates in the marketplace. Some logos even have a personality of their own, embedding themselves in the minds of the population and becoming a permanent part of the cultural landscape. At Sad Monkey Media, we love looking to the past for inspiration. Here are some logos from organizations in the past that still strike a loud chord, including one from our city of Amarillo, Texas. Don’t be surprised if you see any of these companies revived, simply because people still remember them so well. That’s due in large part to the strength of these classic logos. Founded in 1927, Pan American Airways was synonymous with globe-trotting for over six decades. With only slight alterations, the iconic blue globe embodied the airline from 1951 until Pan Am ceased operations in 1991. Designed by Joseph Montgomery of Edward L. Barnes Associates and rejuvenated by Chermayeff & Geismar, the Pan Am globe was as recognizable as Mickey Mouse or Coca-Cola. Everyone assumed Pan Am would be around forever, and it appeared in the futures depicted in science-fiction films like Blade Runner and 2001: A Space Odyssey. Jack Turner got his start building one-of-a-kind vehicles and race cars. Active from 1951 to 1966, Turner Sports Cars created stylish roadsters known for their excellent handling. These renowned cars were produced in small numbers, so remaining examples in good condition are rare and sought after. The company’s logo utilized a symmetrical coat of arms. The high-contrast color scheme and powerful use of negative space creates an image of dynamic strength. We wouldn’t be surprised at all to see this logo return on a future automobile. The fondly-remembered Providence Steamrollers basketball team unfortunately never steamrolled anyone. One of the initial eleven teams making up the Basketball Association of America, the Steamrollers hold the record for fewest NBA games won in a season. The team folded in 1949 after only playing for three years. Basketball historians probably remember the team for having the tallest player in the NBA’s first year, but we’re more concerned with their gorgeous logo. This powerful art deco steamroller barrels toward the viewer, a convincing combination of style and intimidation. While it’s hard to imagine a steamroller mascot costume, we wouldn’t mind seeing the Steamrollers make a comeback. General Magic was an influential California software and electronics company. They paved the way for technologies like USB, small touchscreens, online gaming, streaming television, and online shopping. Their logo, created by noted designer Susan Kare, captures a feeling of whimsy and forward thinking. The style invokes novelty companies like S.S. Adams and the classic cartoons found in the New Yorker. The 2018 documentary General Magic tells the story how the ambitious company attempted to build a smart phone in the 1990s. Aside from its incorporation in 1960 and its dissolution in 2008, there’s not much information on the internet about Quietflo Engineering Ltd. of Middlesex. But the logo speaks volumes. While the design isn’t perfect, it incorporates a visual representation of the company’s name and goal, creating quiet flow in a mechanical system. The chaotic wavy lines on the left transition into calm straight lines on the right. This subtle storytelling is difficult to achieve in a single image, but worth the effort when done right. With its painted covers and popular characters, Gold Key Comics captured the imaginations of millions of children in the 1960s and ’70s. For decades, you couldn’t pass a newsstand without seeing their distinctive golden logo. Their licensed properties included Disney, Looney Tunes, The Lone Ranger, The Addams Family, Star Trek, and The Man From U.N.C.L.E. The company also saw the birth of original characters who still appear today, such as Doctor Solar, Turok, son of Stone, and Magnus, Robot Fighter. Older comic book fans still have nostalgia for the Gold Key logo, which represented a wholesome product with dependable quality. While kitsch goes in and out of style, it’s hard not to love this imaginative logo. What little we know of the Sea Grill of Fort Lauderdale, Florida, comes to us from vintage postcards and matchbooks. The style reminds us of the slick animated television commercials of the 1950s. The restaurant later switched to a less memorable logo, but designers will continue to grin at this creative design. James Spratt, an Ohio lightning rod salesman, founded the first large-scale dog biscuit company around 1860. Originally marketed as a luxury item, Spratt’s was the first company to erect a billboard in London. During World War I, they supplied army dogs with over a billion dog biscuits. The original factory still exists in London, signage intact, as residential workspaces popular with creative artists, including animators and architects. The company boasted many logos in their relentless advertising in the early 20th century, but we love the classic Spratt’s dog, designed by Max Field-Bush in 1936. There are many beautiful hand-lettered department store logos to choose from, but at Sad Monkey Media we’re passionate advocates for the Texas Panhandle. White & Kirk opened their department store in downtown Amarillo in 1938. Called by the Amarillo News-Globe “the Last Word in Modernity,” the building combined art deco and Southwest styling, and was one of the first buildings in Amarillo with air conditioning. Their curvy logo brings to mind an inviting sophistication, easily connecting with their West Texas audience. While White & Kirk moved into the Western Plaza mall and later disappeared, the historic building still exists at 516 S. Polk Street in Amarillo. Logos will always be the keystone of effective branding. As Sad Monkey continues to create memorable images for our clients, we’ll look for inspiration in the past while designing for the future. If you’d like us to create a logo for you, please contact us. We’ll help you build a brand people remember. All logos are assumed public domain or copyright their current rights owners. 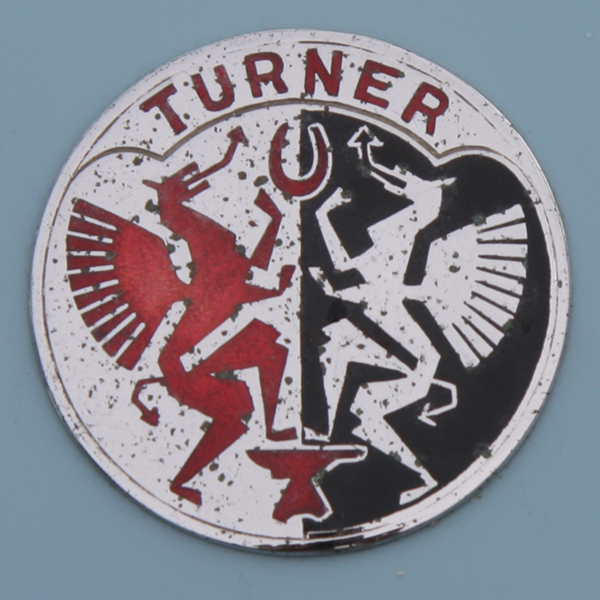 "Turner badge" by Brian Snelson is licensed under CC BY 2.0.